The western highlands of Vvardenfell are known as the West Gash. It’s a matter of Elder Scrolls lore, and the sooner we get over that fact, the sooner we can talk about their reimagining in Skywind. Okay? Okay. 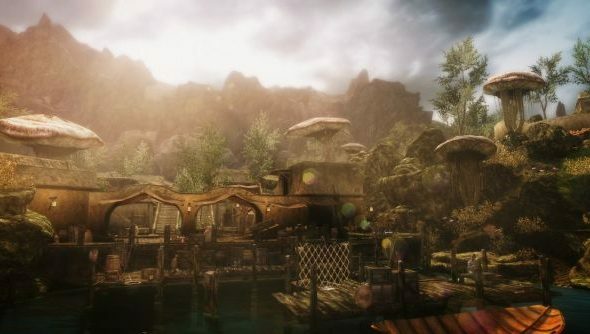 It’s a source of administrative aggravation that we can’t yet add Skywind to our list of the 100 Best Skyrim Mods, because it isn’t finished. But the latest alpha footage shows that a familiar landscape is beginning to emerge. These environments, and the ones like it you might have seen showcased in another Skywind trailer, are really all there is of the mod right now – hills, ‘shrooms and static meshes. “We are currently working on getting all of the quests, npcs, weapons, creatures, etc. working correctly, and they should all be available by the final release,” say the team in their FAQ. This video is just the latest in a concerted recruitment drive by the Skywind team. Their ranks have now swelled to the point where we can expect “more regular video uploads” and a “HUGE update” in the near future. Which would be lovely. Do you think Skywind can pass through the elephant’s graveyard of abandoned mod remakes and come out the other side as a Black Mesa?